Feast of Saint Francis of Assisi. I am now accustomed to wake up to the sound of braying. Aitana does a high-pitched multiple bray; Morris joins in with a deep-throated roaring one-off bray; then Matilde makes a sad drawn-out lowing cow noise. Rarely, but quite distinct, there is sometimes a half-strangled sort of bray-cough sound from Rubí, who only recently surprised us all by overcoming her former silence. If the donkeys are not fed by eight o’clock, the braying becomes regular and very plaintive. When I was teaching I had to be up at six to get everything finished here and be in school by eight o’clock. Now, I like to allow myself the luxury of a slower start to the day, but the donkeys always make sure they are heard. Whatever mood I wake up in, however much I might want to focus on other thoughts about the day ahead, the braying ensures the donkeys get my full and undivided attention; and they will not quieten down until they get their straw and alfalfa mix. (Note to donkey diet bores: not too much alfalfa but just a little to flavour the straw.) And then we have peace in El Parral: the normal silence of the place returns. It is only punctuated by the sound of the breeze in the pine trees and the gentle rhythmic sounds of four happy donkeys munching. And I am thinking about this on the feast day of Saint Francis of Assisi, whose focus was always on the poor. Outside of this place is a world that needs more braying. It is increasingly a world dominated by the demands of the powerful, as the gap between rich and poor widens. The media more often focus on the selfish narcissism of a narrow group of personalities whose faces dominate the TV screens and features of the press. Environment campaigner George Monbiot has written a thoughtful piece this week about the trend towards a fascistic cult of personality that concentrates on the same powerful people every day. There is an endless cycle of Trump, Putin, Merkel & Co. This cult of personality ignores the needs of the majority and works against the needs of society or any sense of true community. And I begin to seriously wonder: where is the sound of frantic braying? The desperate pleading bray of those in need? It seems almost totally absent. If you are under threat, isn’t it natural to shout out? The world-dominating cults of the personalities mentioned above are aped by May and Corbyn, Boris and Mogg: the dwarves in the Brexit freak show. This is a sad little circus which has very little global significance, but it nevertheless affects the lives of some sixty million inhabitants of the UK including three million EU residents, and also the one million of us UK residents in the EU. Anyone who takes the trouble to read the information – and I mean the official economic forecasts – can see that Brexit is an instant and obvious political and social suicide note. But again, I don’t hear the frantic braying. On the donkey field, when there is any percieved threat to the herd, Rubí donkey immediately leads the others into defence. Gazing intently into the distance, they make those deep-throated aggressive snorts that the “sheepdonks” in the photograph above will make to scare away wild dogs and protect the sheep. It is atavistic behaviour from long ago when donkeys were in their natural habitat in the African savannah. It is so deeply ingrained that Rubí is still worried that there may be a lion lurking in the pine trees. The Brexit referendum was arguably the greatest electoral fraud in British history. There is enough evidence now to demonstrate that the Leave campaign was actually criminal, involving misuse of millions of people’s personal data, money laundering, and blatant flouting of electoral and data protection laws. The evidence for the manipulation of the Brexit referendum is now being revealed. Not by any enquiries in the UK, but by the Canadian government and the Mueller enquiry in the USA into Russian involvement in Trump’s election. I wanted to get all of the links to these developments on here today, but I am going to delay because there are major developments in both Canada and the USA, with CBC (the Canadian television) doing an exposé on it today and the New York Times and Washington Post seem to be in hot competition to piece together the Russian connection between Brexit and the 2016 US election. In the UK, the only main news medium carrying the Canada revelations is LBC, with some great work by James O’Brien. Of course, the Guardian’s tireless Carole Cadwalladr is also on the case. Meanwhile, some valiant people are taking legal action to try and halt Brexit with an enquiry, as reported by The Independent. Virtually nobody else is reporting this, such is the establishment desire to shut this down from public debate. Brexit is a scam, a fraud, a crime. Don’t let them do it. Please start braying, folks! Note: The Canada and USA Brexit conspiracy investigations are still developing so I will delay the summary I was planning here of the reading I did earlier in the week (as announced in a comment on the Rubí blog on Tuesday.) I’ll come back to it later. Meanwhile, here at 8.25 a.m. and there is a lot of braying out there. 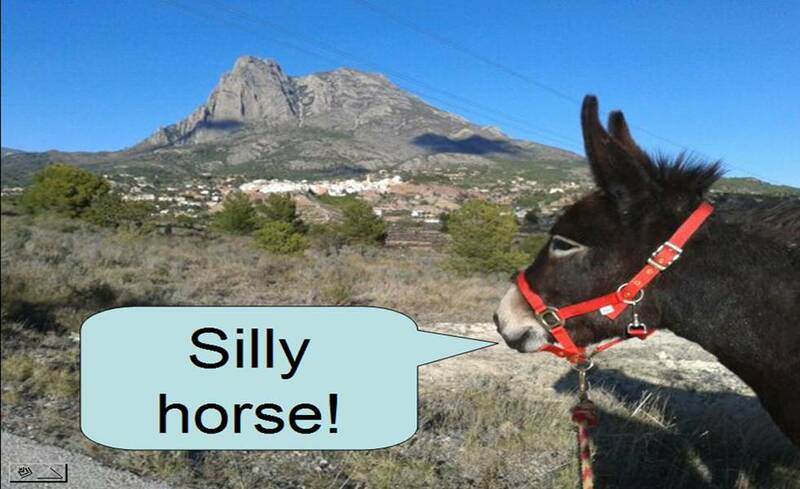 OK donkeys: I’m on my way! Today’s equusasinus blog post bang on target. The document I attached here for you to read has also been seen now by Tom Watson MP, Deputy Leader of the Labour Party, who has written to the Foreign Secretary asking for answers. Now try keeping this out of the UK mainstream news. Bray bray bray everyone! The Conservative Party conference this week has proven that they are all a pack of lions, headed by Boris Golden Mane Man. There are coach loads of Brexitdonks, from across the country, travelling down to London on October 20th for the People’s Vote March. We are going down by train to bray as loud as we can! Happy Feast of Saint Francis! Lovely photo of sheepdonks! Will put the news on later to see whether the BrayBrayConservatives (BBC) manage to report on this. How long can the government keep this up for? !